108 Rock Star Guitars has invited the Women’s International Music Network (WiMN) to share its booth during the 2016 NAMM Show in Anaheim, Calif. Located at Hall C, Booth #4386, this centralized location will serve as a launching pad for interviews, meetings, performances, and book signings. 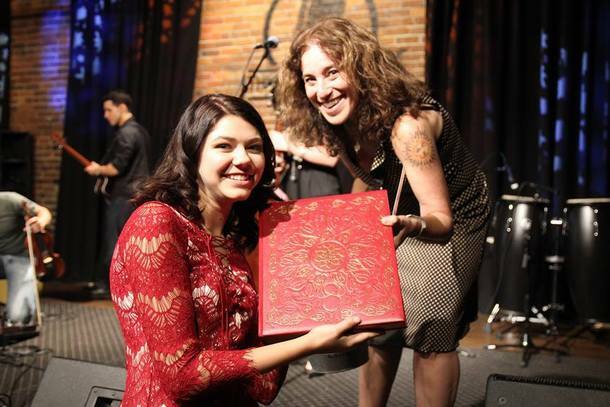 “108 Rock Star Guitars has been an advocate of the WiMN, supporting its She Rocks Awards and showcases throughout the year. Sharing a space like this together is a great fit and a natural extension of our partnership,” said 108 Rock Star Guitars author and photographer, Lisa S. Johnson. 108 Rock Star Guitars is an embossed, red leatherette book by photographer and author Lisa S. Johnson launched in 2013 (hardcover) and 2014 (softcover). Eric Clapton, Bruce Springsteen, Jimmy Page, Keith Richards, Jeff Beck, Nancy Wilson, Bonnie Raitt, Slash, Carlos Santana, Jack White, Ronnie Wood, Lou Reed, Ace Frehley, Billy Gibbons, Don Felder, Joe Walsh, Robby Krieger, Willie Nelson, Johnny Winter, and Les Paul, who also wrote the foreword, are among the rock stars whose instruments are featured. A percentage of the book proceeds benefits The Les Paul Foundation http://www.lespaulfoundation.org. 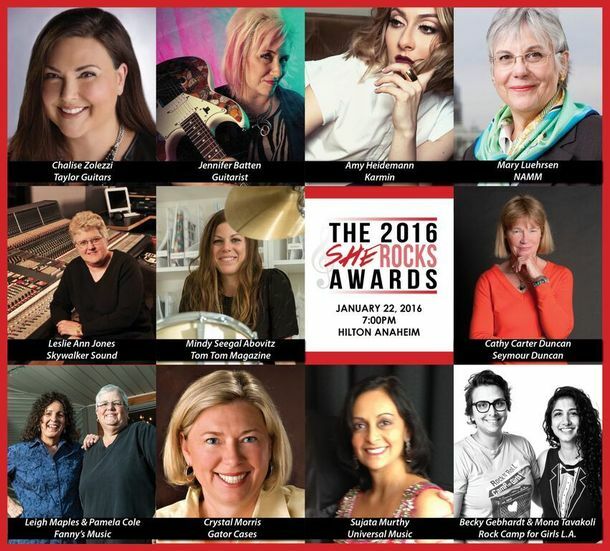 The Women’s International Music Network (the WiMN), is thrilled to announce the 2016 She Rocks Awards honorees. 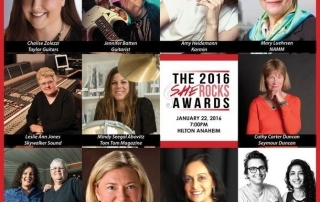 Paying tribute to women in the music industry, the 2016 She Rocks Awards at the NAMM show will take place on Friday, Jan. 22, 2016 at 7:00 p.m. at the Anaheim Hilton Hotel in Anaheim, Calif. Tickets are available for purchase at sherocksawards.com. Additional recipients will be announced in the coming weeks. “We could not be more proud of our 2016 honorees. Each has contributed to the industry in her own unique way, inspiring and helping others through her tireless efforts. It is so thrilling to be able to honor them all and share this celebration with colleagues and fans both male and female,” said the WiMN founder, Laura B. Whitmore.